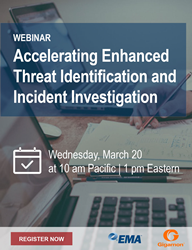 Enterprise Management Associates (EMA), a leading IT and data management research and consulting firm, today announced it will host a webinar titled “Accelerating Enhanced Threat Identification and Incident Investigation,” featuring David Monahan, managing research director of security and risk management at EMA, and Stephen Hinck, product manager for Gigamon Insight. In January 2019, EMA released its “Security Analytics for Threat Detection and Breach Resolution in 2019: EMA Top 3 Report and Decision Guide.” The research that was conducted for this guide revealed that only 28 percent of organizations have alerting systems with enough context to provide highly accurate incident classification, thus requiring manual verification and reclassification of 95 percent of most organizations’ incidents. In addition, 48 percent of organizations had a security incident that caused moderate to severe business impact. Undoubtedly, delays in identifying threats and the lack of information that extends the length of incident investigations cause real business problems.